I admit, I have a very difficult time being objective about this game. It was the first hobby game I ever bought way back when I was in the fourth grade and I just haven’t gotten over it even to this day. 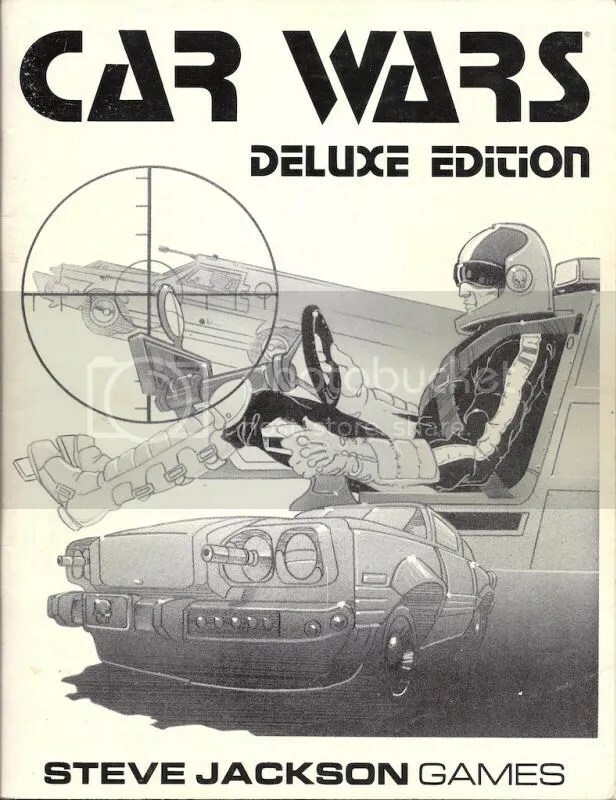 It quickly became a monster hit and I wasn’t the only one that played it to death back then; as the proprietor of Wayne’s Books can tell you, “Car Wars box sets, more so than other game lines, are typically very used. Owners played their Car Wars sets.” But what if it’s over now? Am I just hung up on a clunky old game that doesn’t matter anymore? Is the enduring appeal of this game something that’s just in my head? A couple of years ago it sure looked to be the case. The revamped 5th edition had pretty much fizzled a decade or so before that and the fallout was fairly discouraging. I’d show up to board game meetups with my old microgames and nobody would deign to play them. I would have thought that it was just me and small cadre of dedicated fans quietly soldiering on in the shadows, but then the Ogre Kickstarter happened. It not only brought in close to one million dollars, but it got a lot of other excited talk going about everybody’s other favorite game from the eighties that came in one of those iconic small black plastic pocket boxes. 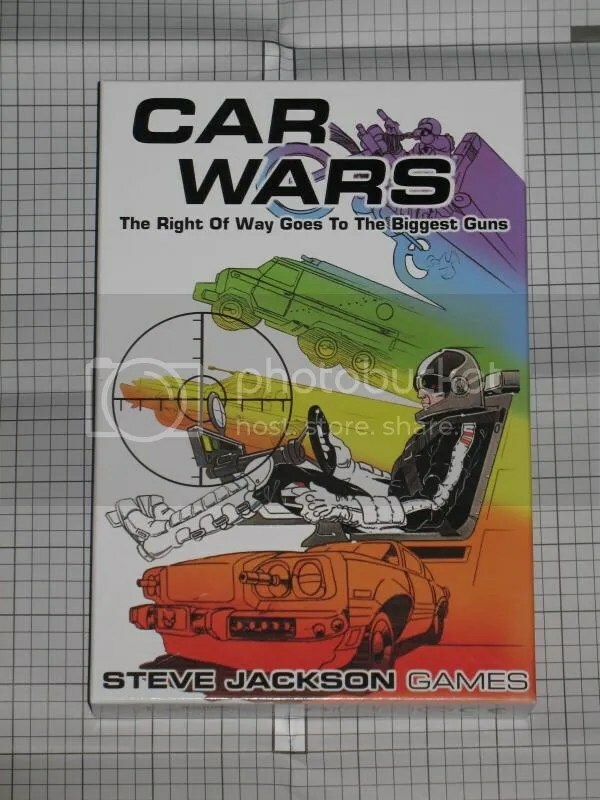 Steve Jackson Games read the writing on the wall and agreed to resurrect the definitive game of high speed automotive mayhem. Car Wars was going to make a comeback. And it wasn’t just talk, either… because it really is back! Yeah, there’s a double sided map included with the game. Yeah, racing gets first class treatment in this set via the crossed oval track here. And unlike our black plastic pocket boxes from way back, this edition comes with a full-sized ready-to-play arena on the flip side. And yeah, whoever put this incarnation of the game together did some slick stuff to allow these two maps to have several different play options available for them. BUT… these maps really are kind of ho hum in comparison to some of the better ones from the expansion sets. I mean, the track doesn’t hold a candle to Muskogee Fairgrounds. 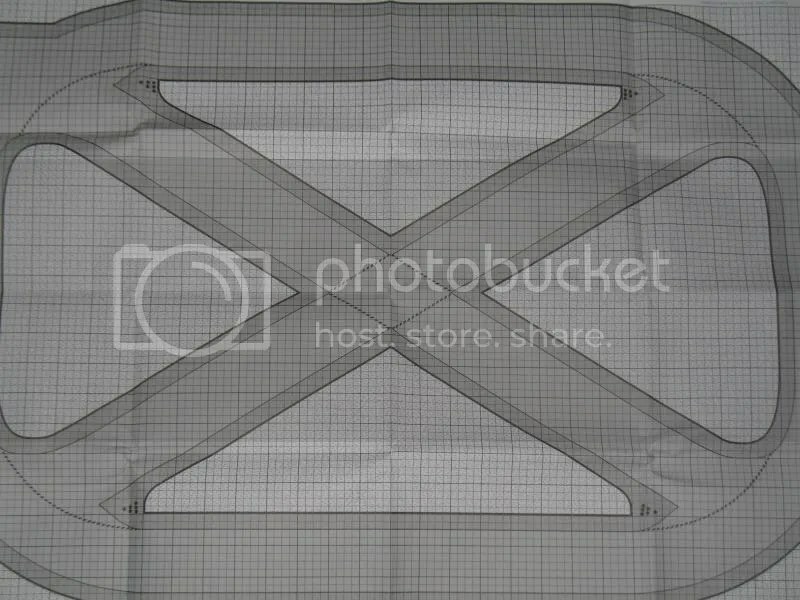 The arena scores a big “meh” when put beside Double Drum or even The Rubberway. 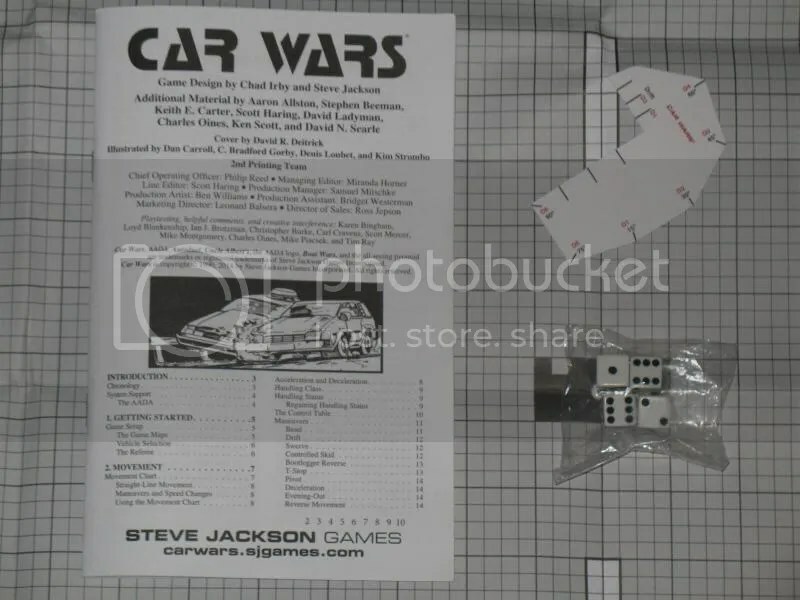 Okay, okay… I can see that they couldn’t justify loading this box up with a set of blank Car Wars maps. But… how can you hand people a Car Wars set without any road sections in it? That’s just… wrong. Yeah, I get that you can fake it with the track map, but still… that’s WRONG!!! Hopefully you can tell that I’m scraping the bottom of the barrel here looking for things to complain about, but… I don’t really care for the stock vehicle list. (It should have had the exact “Autoduel America circa 2034” stats to go along with the counters that we have here. Every counter has a backstory… and it adds a lot to play to have them represent something that’s “real.” BattleTech and Star Fleet Battles players always had that privilege; Car Wars players should get it out-of the-box, too.) There are no trike counters or record sheets. There are no stats for when the tool kit is carried as cargo. (It’s one space and forty pounds, by the way.) The most important rules change that came after this is not here: the nerfing of the ramplate accessory which was published in ADQ 10/1. There’s a confusing typo in the example of the collision rules on page 19. The ultra-essential rules on handling status recovery appear to contradict the rules given in the section on driver skill. (Take it from me, the rules as written in the skills section should take precedence.) And no, none of this is a showstopper, but for a game that produced as many heated rules arguments as this one did back in the day, it sure would have been nice to have some tighter editing on this stuff. But none of that matters, really. I mean, all of that can be worked around one way or another. The real question is how does it play. Well I’m here to tell you, this is perfect replica of the best all around standalone Car Wars product that was ever released. We’ll take a drive down memory lane in order to explain why…. This gets a little deep, but you’ll come out of this with a fairly complete history of the game’s evolution. So let’s punch it! The Pocket Box — This thing was a big deal, but really… it was the least that was absolutely necessary to get the line off the ground. Grenades would just miss, even if you threw them at a screaming horde of oncoming motorcyclists. The collision system was resolved by executing a three inch drop of the car counters. Setting a vehicle on fire required ten hits in a single turn with an incendiary weapon, making lasers the pyromaniac’s weapon of choice instead of the flamethrower. (Horrors!) All the cars had the same top speeds. The game didn’t include a turning key and instead used a bizarre grid-based system that was hard to understand. It was wedded to a relatively clunky ten phase movement system. For people with a lot of experience with what the game ultimately became, it really is hard to imagine how this could have been the hit that it was. Nearly every aspect of it would get reworked in subsequent iterations and it is very, very difficult to drop back into this incarnation if you’ve played any other version. 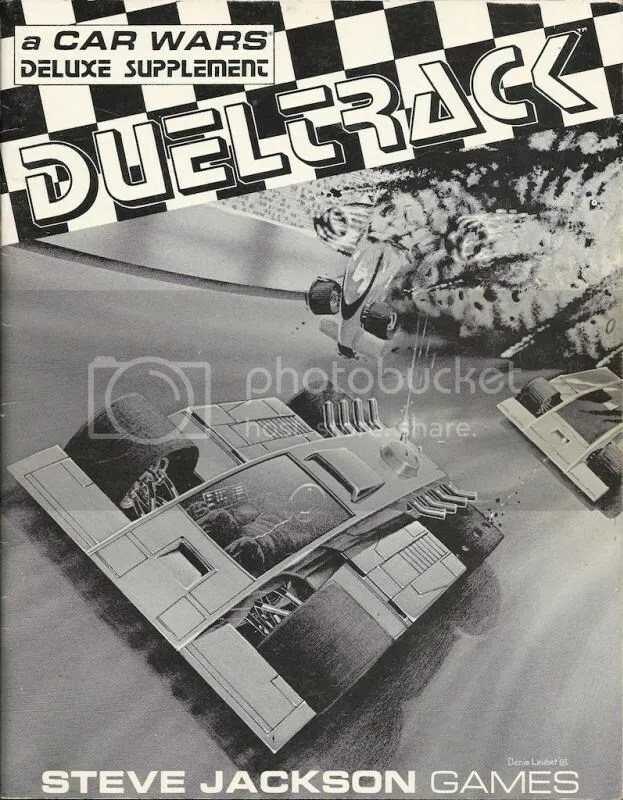 One reason that it worked so well in its time was that most people would have tended to end up running a lot of road duels straight out of the box while at the same time emphasizing the role-playing aspects of the game a bit more. 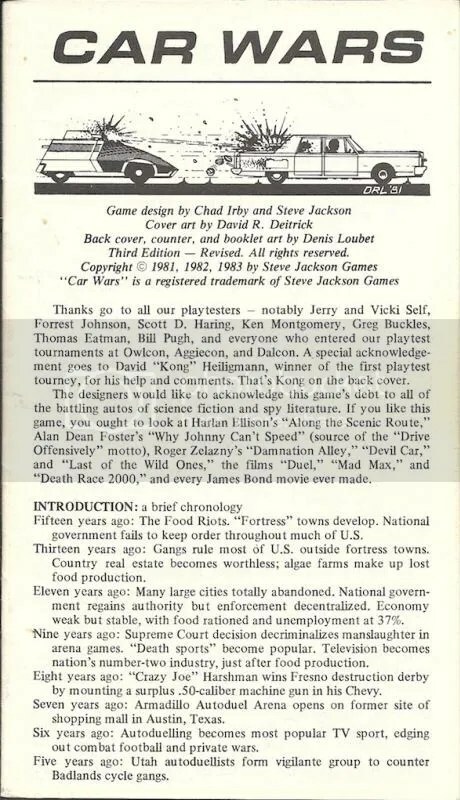 Indeed, Truck Stop and Sunday Drivers were even billed as “role-playing supplements” in the ad copy. It wasn’t until the player base shifted the focus of their play to being centered on arena combats that the more subtle weaknesses of the earliest editions would really start to get flushed out. Deluxe Car Wars — This thing was a very big deal when it debuted. Or as the ads put it, FAAAAAANTASTIC! 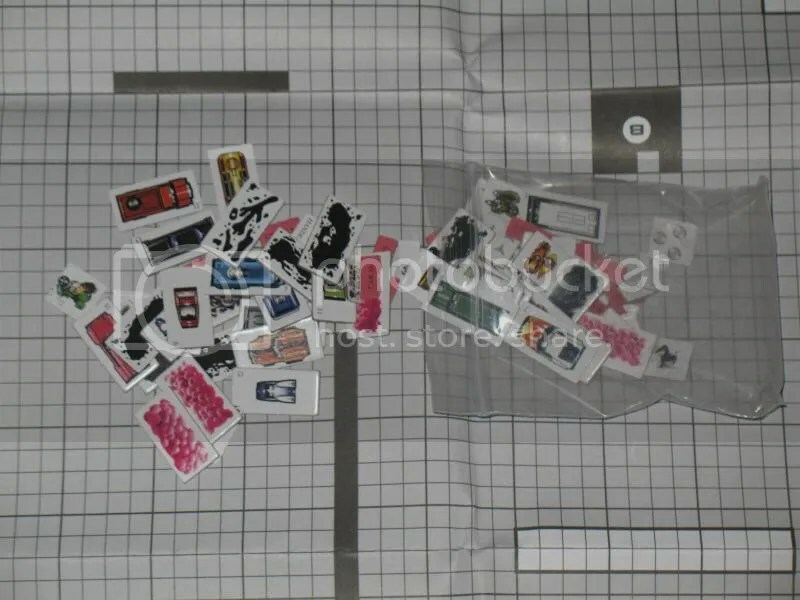 It compiled everything from the three black plastic pocket game sets, added in the helicopter rules that were the only things in Autoduel Champions that Car Wars fans actually cared about, integrated trailers and ten wheeled trucks from Autoduel Quarterly, included the turning key that first appeared in Expansion Set #2, and folded in the new grenade rules and the “variant fire rules” (also from ADQ) which just about everyone would end up playing by during the game’s heyday. The biggest all around change to the rules, though, was the addition of a new speed modifier to make vehicles harder to hit if they drove fast. Line manager Scott Haring was sick of convention style tournament games where the duelists would just roll into the arena at 5 mph and then plink at each other while pivoting around. (Scott gives a full explanation of this in his designer’s notes in ADQ 3/2.) The fact that the rules had up to then failed to sufficiently disincentivize those tactics before were indeed a legitimate game design flaw– but it wouldn’t have been as obvious of an issue in highway scenarios. The other big change was altering the way the game reset the handling status at the turn break in favor of gradual handling recovery. Again, this addressed a problem that just wasn’t that noticeable in freeway based scenarios: without this rules change, people would end up making ninety degree turns almost every second in their arena dogfights. That sort of action was wonky and ridiculous… and worse, it just didn’t feel like a real simulation of what driving is really like. The change did mean that every single adjustment to handling status suddenly mattered a whole lot more: a mistake in keeping up with the tally would have just sort of come out in the wash with the old pocket box, but here… bad accounting would confer a pretty significant and ongoing advantage. Another subtle problem caused by this change was that HC 1 and HC 2 vehicles were basically undriveable in combat situations under these rules, making it not worth to savings to cut back on a car’s suspension anymore. (No biggie, but… I really liked the Joseph Special and the Ambunaut’s extra character due to their being harder to drive.) Nevertheless these rules really did a great deal to spiff up the action in arena dueling games. But this was only the beginning of Car Wars‘s rule development. 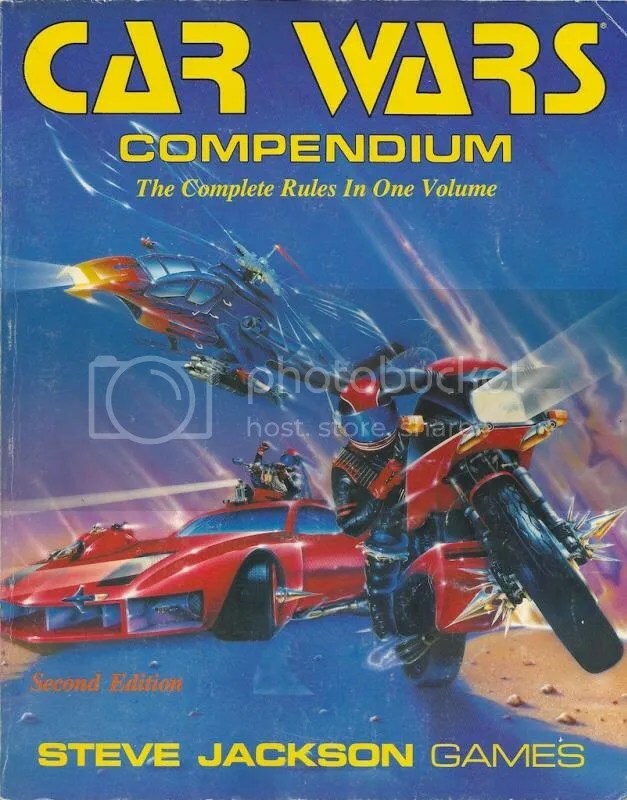 Car Wars Compendium — The game just kept sprawling out, but by the time this particular volume reached its second edition, everything was pretty well nailed down. Adding in boats and hovercraft was kind of cool at the time, even if people didn’t play with them that much. The arena duelists that were used to digging through Uncle Albert’s catalogs and scads of old ADQ issues rejoiced to finally get all the game’s equipment fully revised and integrated into one place. The typical autodueling fan at this point was very much enamored with tricking up the perfect $30,000 luxury car in order to completely destroy his buddies’ vehicles in the arena. (Dyson Logos says he’d spend 8-10 hours working on his designs before a game session back then.) Many of the game’s role-playing aspects were quietly retired from actual play as more sophisticated rpg’s took over the market’s mind share. AADA Divisional Dueling was king! Less remarked upon, however, are the many incremental changes made to the game’s maneuvering system. The potential of the turning key was now fully realized in order to allow a much wider range of realistic maneuvers, from controlled skids to t-stops. The crash table results were further refined and new modifiers where added in order to discourage drivers from arbitrarily making ninety degree turns when they got down to -6 handling status just because they wouldn’t otherwise have anything to lose. The movement chart was cut back to five phases and reworked in order to allow for mid-turn accelerations, opening up new tactical possibilities and preventing some weird movement-related situations from happening. Finally, the speed modifier rules were tweaked to make the target’s “crossing the t” yield the full to-hit penalty while tailing someone would make them comparably much easier to hit. The game was just really tight at this point, and many of the unanticipated problems that were introduced by so many incremental tweaks and patches over the years were finally sorted out. (Complete details on all the differences between this and the first edition of the Compendium can be found in ADQ 8/2.) Even the overpowered spoiler and airdam accessories were dialed back into something that didn’t upset the game’s feel so much. The only real problem with this was that it was just a little bit too much. Players and referees had a hard time saying “no” to anything introduced here and lacked the sort of self control that would have allowed them to dial things back to more workable equipment and vehicle design options. People blamed the game for this and new players were perhaps overwhelmed by the full extent of the game’s glory. As good as it was, this was not a gateway product by any stretch! Fifth Edition — This one was a complete disaster. Now, I’m not saying that nobody got any enjoyment from this one. But seriously, you can’t have a Car Wars game without a vehicle design system. This didn’t and that’s just unthinkable. Adding insult to injury, a “gotta get ’em all” marketing strategy spread the vehicle designs and counters you’d need to run a standard six car event over three booklets… basically “forcing” you to buy the same rules several times to get what amounted to half a game. Still, a lot of effort was devoted to making it easier to play, and though not everything done was a bad idea, this game was just not nearly as successful as ADB‘s reworking of Star Fleet Battles into the much more playable Federaction Commander. For instance, switching to a three phased movement system while upscaling by a factor of three allowed the movement chart to be completely eliminated. (Everyone just moved one inch per 10 mph of speed each phase.) Just about all of the charts and tables would fit on the oversized turning keys. Unfortunately, the design choices just didn’t work together from a synergistic standpoint. At the bigger scale, the average kitchen table made for a much smaller arena relative to the typical arena map fans played on back in the day. The lack of granularity really failed to capture the sense of maneuver and the feeling of vehicular dog-fighting was lost. Losing the grid made it hard to tell what was even happening on the board. The sequence of play allowed for chintzy “shoot-shoot-move” tactics that just flat out handed the game to people that knew how to work the turn break and the order of precedence in their favor. Finally, the stock vehicle designs in the game were often under-gunned and over-armored, resulting in sessions that could be won only by executing multiple t-bones or shooting out multiple tires on your target. 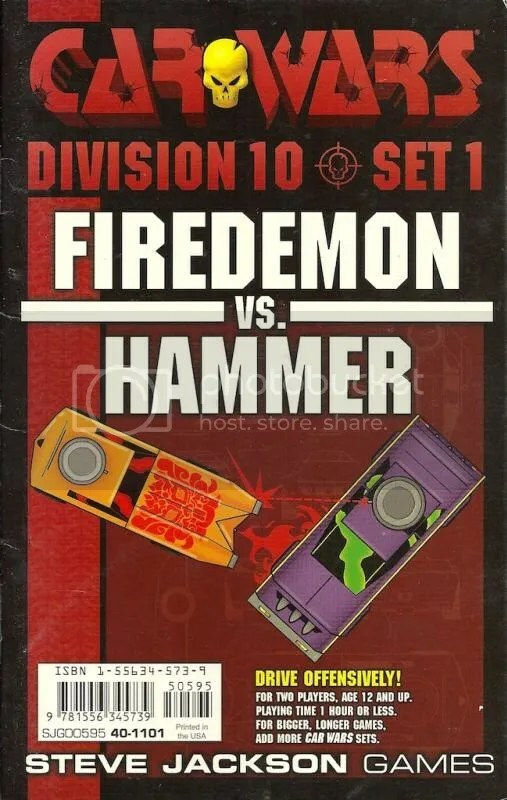 All the effort expended on making the game faster and easier to play was wasted because (out of the box) the combats would (especially at Division 5) almost inevitably tend towards requiring the most complicated and difficult to adjudicate rules sections: all that heady stuff about the collisions and tire blowouts! That said, the game wasn’t all bad. The fire and explosion rules in this incarnation were quite good and well worth stealing and applying to previous iterations of the game. Instead of allowing incendiary attacks to result in lucky explosions the first second that the fire extinguisher fails to put out the flames, these rules force flame jockeys to fully burn through the armor before that can happen. Even better, duelists traveling recklessly at high speeds have a much better chance of the having the flames go out. Unrealistic? Maybe. But it sure is fun! It’s one more thing to punish “turtle” tactics, and that’s almost always a good thing in direct conflict games. For that reason alone, we’re grateful for this release. 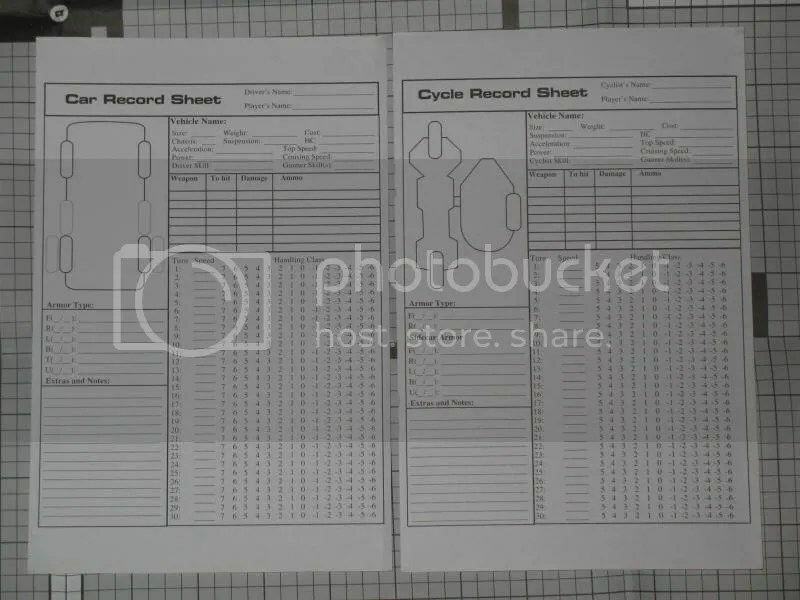 A minor nitpick: while the forth edition set includes rules for building three wheeled trikes, it does not have an associated record sheet for them. No biggie, but it still seems incomplete. So you can see from the above, the game progressed from “rough-but-playable”, to adding in some half baked but necessary changes, on to “solid-but-excessive” before speeding off into the sunset and into a disastrously ill-conceived revamp. 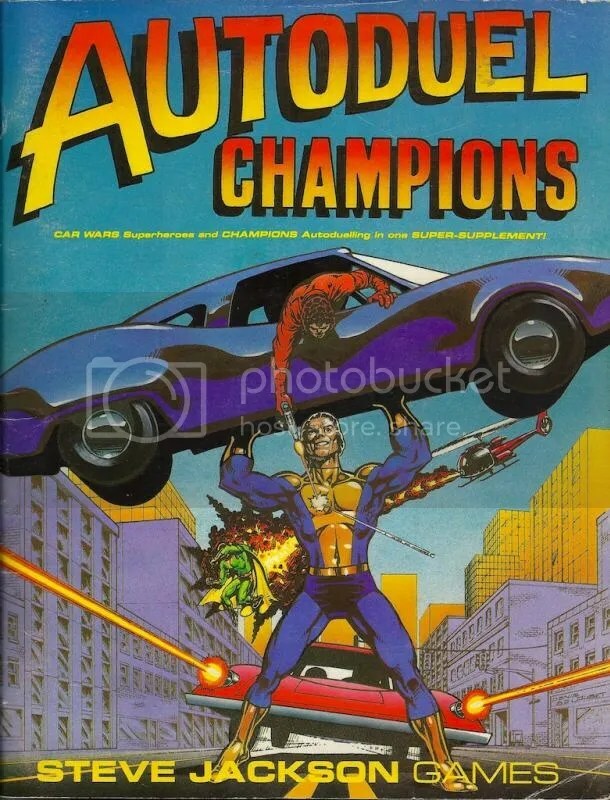 If you could take the best parts of the second edition Compendium, strip it down to just cars, cycles, and trikes and then get rid of the most problematic equipment like jump jets, gyrosluggers, and laser guidance link… then you’d have just about the best possible Car Wars set around. And that’s what this fourth edition reprint is! One of the strangest Car Wars supplements ever produced. You’ll find neither the superhero rules nor the helicopters in the fourth edition reprint. Not that there aren’t games along the lines of Car Wars that are designed for people like that. The funny thing is, that you can simplify and boil things down and strip out everything that’s not “elegant” and work out these incredibly efficient game mechanics that accomplish so much stuff with so little… and you still won’t do anything for them. Take Wings of War, for instance. It’s a cute little package. It’s about as simple as you can make one of these “little things shooting at each other” type games and still have it feel like you’re almost kind of modeling something. You can get these games in with dogfights between historical WWI and WWII era planes and each variation captures the differences between the two eras with just a few deft alterations. And those models look really nice, too. It’s relatively easy to teach and sessions don’t take too long… but it’s practically as hard to find players for Wings of War as it is for Car Wars. In some ways, it’s even harder– and not just because “retro” is in, either. Car Wars can be run as a straight ahead miniatures game, as a continuing role-playing game, or even as something pretty close to a board game. It’s incredibly flexible, able to support a huge range of scenario types with a complexity level that can be dialed in to exactly where it best suits the people that are on hand to play it. You can adapt Car Wars to a particular player’s tastes in ways that Wings of War just can’t handle. 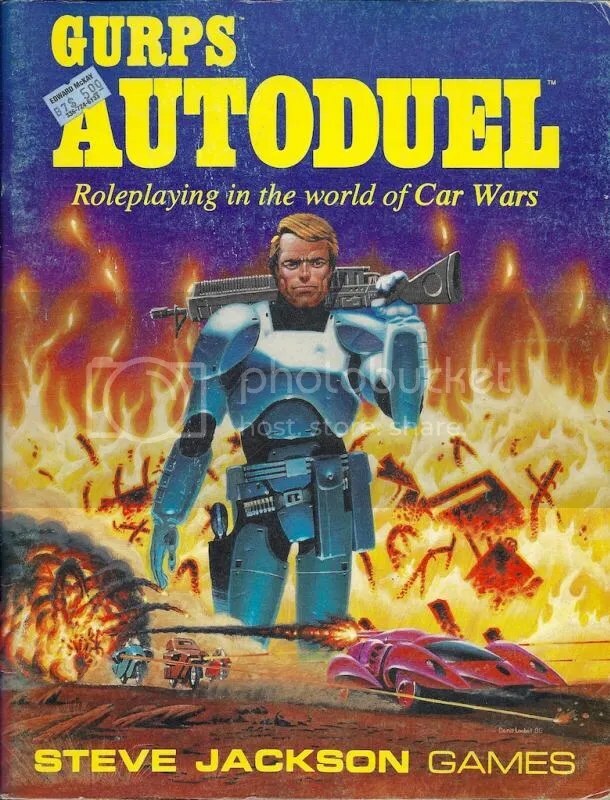 The second attempt to adapt Car Wars to a “real” role-playing game. Gamers tended to prefer Car Wars, though. But here’s the kicker. As good of a game as the Wings of War line is… it just seems to me that the sort of person that it would appeal to just tends to get so much more out of Car Wars. I admit I don’t know the actual sales figures and so forth, but to me… all that effort that’s gone in to streamlining things in order to appeal to typical board gamers… it just seems like wasted effort sometimes. It doesn’t actually satisfy those people and it actually undercuts the sort of thing that appeals to the “real” target audience. Not everyone is going to agree with my assessment on that– and hey, my experience with gamers in general maybe isn’t representative– but I get it that “simplicity” and “elegance” are way high up on the list of things that people are demanding nowadays. As contrary as I might be, I won’t deny it. But my advice on how best to apply that philosophy to Car Wars is to leave the rules alone and instead focus on the scenarios and equipment lists and vehicle designs as a means of getting a quicker playing and easier to run game going. You can create are leaner meaner Car Wars without throwing out all the hard work that went in to refining the game. Play with stock designs instead of letting everyone design their own car. That cuts complexity and playing time in half right there! Don’t allow gunners and passengers. The extra firing actions take too long to deal with. Phased movement is nearly unnecessary in road combat situations unless the cars get really close to each other, so if you’re looking for a quick game, don’t overlook the joys of road duels. If you do all that, you get most all of the benefits of an overhauled game, but you keep the realism and the role-playing elements and you still keep the option to go as far down this rabbit hole as you wish…! And people do. I mean, sure… the quick one hour battles are fun and all. But people will still go and set up a gigantic battle royale, play out insane pitched battles inside of city limits, work out complicated cross country road trips in a post-apocalyptic wasteland, and stage complicated team events centered around deadly slalom runs. It can take all day to get through some of the more monstrous scenarios… but the time really flies. Gas engine rules debuted here, but you won’t find them cluttering up the 4th edition reprint. Oh, and yeah I admit… “real” role-players will typically choke when they see the character section. “How am I supposed to run a character that is that simple?” Well look, just tracking your driver and gunner skill and your prestige goes a long way towards personalizing things. It isn’t too much simpler than Traveller and you get a whole lot more than in comparable games like Dawn Patrol or BattleTech. And though it might seem that all autoduelists are pretty much “Jack Burton” knucklehead type characters by default, the thing is… it helps if you remember that your car is just as much a “character” as the driver. And it’s neat. You can soup up your ride with stuff you’ve salvaged from your kills. One day you’re character’s got a totally pimped out van… the next, he barely survives a crash and burn and has to tool around in a subcompact until he can get something better. Becoming an ace is about as hard as leveling up in a classic D&D campaign run by a strict dungeon master– and death rates are comparable. Making it to Driver-1 Gunner-1 is a real accomplishment, especially when you have opponents like mine! But as the eighties wore on, those same death rates were seen as an obstacle to the kind of fun most people thought they wanted to have. The cloning rules first debuted early on in Truck Stop in 1983 and were meant to address this somewhat. I’m actually kind of glad that they don’t show up in this 4th edition set. I mean, you can record my brain and imprint it on a clone of me… but that isn’t me, even if he inherits my mad dueling skills and my stuff. Other people have developed house rules to give saving throws to people that drop to zero hit points to “fix” this. Some of them put in penalties based on how far negative people’s hit points drop… but this doesn’t make sense, really. Car Wars characters are vehicular components with 3 DP. If more damage than that hits them (not counting body armor and so forth), anything beyond that passes through them and goes to the another component or armor facing. By the rules, you can’t actually go negative. My proposal on this design issue is to rate arenas with a paramedic skill level… possibly even a negative one. (Roads and towns can be similarly rated.) Anyone that is killed that isn’t completely blown up gets one chance to be revived at the end of the session. That’s a lot simpler and more believable than the other rules on this, and the paramedic rating meshes nicely with the PR rating that arenas already have as a cash winnings and prestige multiplier. If you want to dial back the death rates, just play in civilized regions that have highly trained medics on hand. Which brings us to the game’s default rags-to-riches campaign. This is at once the most distinctive and least understood aspect of the game. It really got lost in the shuffle once the franchise started to get popular, too. Arena duelists want to just design a car that fits the next game’s budget and then fight. If they do a continuing campaign, it’s usually going to go by the corporate model because that’s about the only way to support a long series of events that are set up based on what everyone in the group is in the mood for. (“Let’s do something off-road this week.”) Role-players are similarly going to just start out the campaign with whatever vehicles and equipment that are required in order to make the adventure the referee has in mind work out. Taken together, these two situations explain why most people skip the default campaign premise most of the time. One of only a handful of games that could sustain a dedicated magazine for years on end. At its height, ADQ was one of the best gaming supplements around. But there’s a more subtle reason that this happens has well: when the Armadillo Autoduel Arena was published it was decided that the amateur night events where everyone gets their start pretty much always use cheapo cars like the Killer Kart. This lead to a change that made the scenario a winner-take-all sort of thing: the last duelist in the arena gets to salvage all of the cars. I guess that’s okay, but if you have a group of players that want to do this… you have to play enough games until everyone has won a game in order to get everyone set up with a continuing character that has a vehicle. I don’t think that’s quite right, as that will take so long nobody can reasonably be expected to do it. The culprit here is the cheap amateur night cars. In my thinking, the networks just aren’t going to cut corners on the vehicles for these events. They’re competing with each other for ratings and are going to choose car designs that create the most insanely awesome footage. Cars with different weapon types coming out of every facing are just the thing: big guns on the front, sure… flame throwers on the back, single shot rockets on the sides, and then maybe something fun like a mine-dropper or a paint sprayer. Amateur duelists– that is, guys that haven’t leveled up in driver or gunner skill, yet– would be welcome back as many times as they wanted to try their luck instead of being forcibly retired after the third attempt. Also, everyone would get to salvage their kills (if they survive the event) and they’d get to keep their car if they can drive out with it after thirty seconds. Just as an example, if a gaming group sets up a series of three amateur night events, they could run the first in Stingers, the second with Joseph Specials, and the third with Hotshots. If they are staged at different arenas, the combination of the vehicle design and terrain difference will require significantly different tactics each time. And everyone will have a pretty fair chance of picking up some wheels before the end. Even better: the car that the players end up with will be put together from the wreckage that their characters risked their lives to produce. When they drive off into some crazy role-playing scenario after that, they will do so in cars that pay homage to the highlights of some killer arena battles. And that’s just cool; it’s like the classic Traveller “life path” character generation system, except that each term is an amateur night event. Fourth edition’s rules booklet, turning key, and dice…. Let’s roll! That’s really the gist of the game in a nutshell. This game was easily in the top ten most popular games of the eighties. It presaged both Magic: The Gathering‘s deck-building and tournament scene… and owned the sort of niche that would later get taken over by computerized first person shooter free-for-alls. It is rightly included in James Lowder’s Hobby Games: The 100 Best. You can walk into game stores right now and see it right next to its original stablemates, Ogre and Illuminati. And that really shouldn’t be that surprising. These games were played to death when they were first released and even after all these years, they’re still worth playing. Times have changed, sure… but nothing has managed to truly replace them. The AADA Vehicle Guide is different from the later vehicle books in that it actually attempted to give an accurate picture of what the most common vehicles on the road were in 2034. 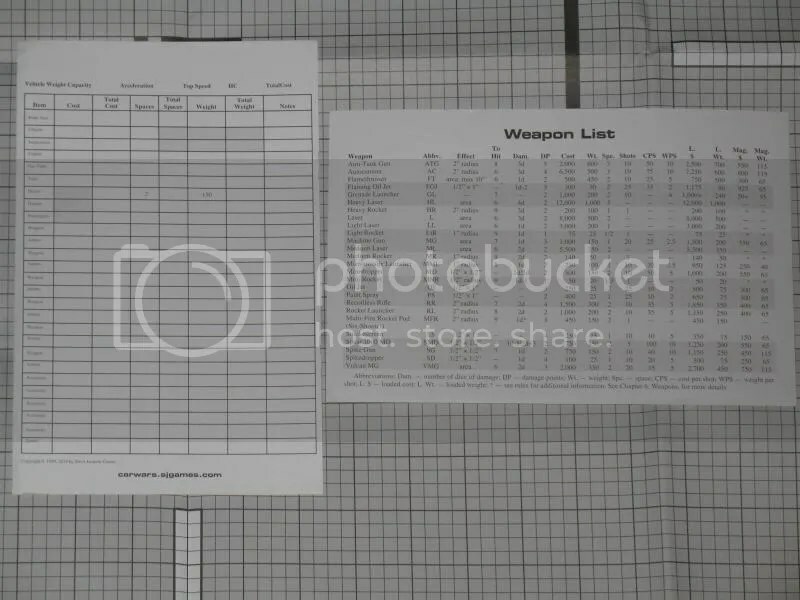 Some of them might need to be updated with new options and equipment, sure, but this was one of the best sources of background information ever produced for the game. Now… if someone would just hire Denis Loubet to paint the counter sheets for these, we’d be set! Arenas! This really is the best part of the game. Armadillo, the Double Arena set, and Muskogee were awesome, sure… but there’s nothing like busting out a set of blank Car Wars map sheets and drawing up the the ones from The Arena Book or L’Outrance. Making up your own is great fun, too. City battles! This is not generally for casual players, but staging a cycle gang attack on a fortress town will forever remain a rite of passage for fans of this game. If the maps from Sunday Drivers aren’t good enough for you, you can triple the size of that play area with the Midville expansion. (Add in the Boat Wars maps to make it quadruple.) If you want the same flexibility you get with the road sections, check out the City Blocks series. You never run out of city with those…. 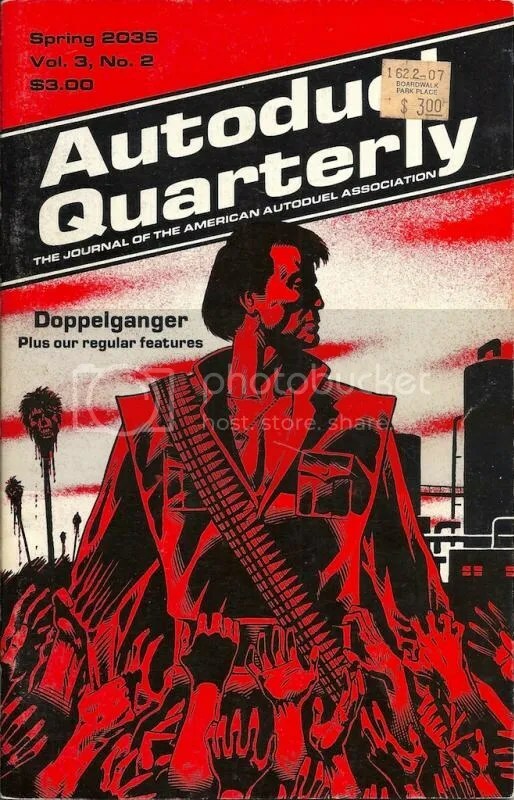 Autoduel Quarterly: really, there is nothing like kicking back on a lazy afternoon with a stack of these things. Up through issue 7/3, it was about the best supplement money could buy. Fiction, a letter column, role-playing nuggets, designer’s notes, variants, and mini-scenarios… wow, this was some good stuff! Rereading these is like watching an instant replay of how each aspect of the game developed over the years. Car Wars appealed to just a huge range of people, too. (If your game group didn’t really “get” the role-playing games that TSR was putting out at the time, they could certainly figure this out.) What would now appear to be almost an OCD level obsession with “realism” in (among other examples) the hovercraft movement rules sits side by side military equipment that pretty much makes no sense. I mean, it’s like the VLAW in this game is something you could pick up over the counter at WalMart or something. But as crazy as all it was, it was unaccountably and engrossingly fun. You could certainly quibble with where the designers and developers drew the line on anything, but the fact remains… the game really hit a sweet spot and caused a sensation. This has probably been a bit too much information if you’re completely new to this game– and if it is, don’t sweat it. This game will not steer you wrong no matter how you play it. Your tastes probably differ from mine, but if you just start playing and make adjustments from one session to the next, you’ll eventually pin down what works best for you. And if you’re still not quite sure what to do when you roll out of the pits and into the arena the first time, just remember this: Drive Offensively! I personally think that Boat Wars is underrated. (I was insanely jealous of my friend’s black plastic edition of that and completely dig the huge blue maps from the big box version.) Thank you for your contribution to the game! I can still smell Car Wars – both the original paper and chits and the melted, exploded, coal-fired, kerosene, blowtorched, hammered, sledgehammered and gunshot hot wheels cars that I bought in multiple duplicates. …because, you know, it was interesting from an academic perspective to convert 1:180 scale to 1:64. Ah…because I liked math? With a large enough turning key, you could play with actual cars…! The best one I had was a silver Stingray that fused weird when I had it in the vice in my patented “Bic to simulate flattened tires” approach. The fire melted a decal or paint or something on the side and I swear it came out looking like a side mounted machine gun. I tried to do the same thing on a ‘vette without a flat so I’d have its pristine pre-violence version. Oops. Melted the windshield and got no gun out of it. I still run events using 1:24 scale models at 8x scale. Had the Deluxe edition, and Dueltrack. Can’t remember if I got the compendium. Now, I will say that having no flip-wrecks is the worst of the deals for me. So are the wreckers on a separate card, or are there just generic wreck cards? In hot wheels terms, I had a pristine, a battle damaged and a wreck version for about a half dozen cars. Strangely, I probably had thirty additional wrecked versions, too. I don’t know, in case you needed a ton of wrecks and no starting functional cars. The color wrecks for the cars in this set are in the Armadillo expansion. There are three generic wrecks in this set that get their associated cars in East Midville. Oh, I misunderstood, thinking there were no wrecks. That isn’t the problem I thought it was. Haven’t played Car Wars in years, but this really makes me want to break it out again. My son is currently in the process of working up a hovercraft design. I should have realized that was inevitable given that his first “serious” hobby game was G.E.V. !